When photons with different polarizations (left or right circular polarization) are incident on the SREC, they will be transformed to SPPs in different routes (path 1 and path 2). Thus, information transformation from spin encoding to route encoding is realized. With the rapid development of quantum technologies, optical circuits become more and more complex. Usually, several classical and quantum optical devices are needed in an optical circuit, which requires high stability. Free-space optics cannot meet the requirement of quantum information for further development any more. However, photonic integrated circuits (PICs) inherit the advantages of both integrated electronic circuits and free-space optics, such as low power consumption, high stability, high integration density, strong anti-jamming capability, and so on. So PICs attract more and more attention in recent years. In free-space optics, information is usually encoded on the two spin eigenstates of photons , whereas the routes of waveguide are used for encoding information in PICs. Therefore, in order to communicate information between free-space optics and PICs, it is essential that information is transformed between these two encoding schemes. The research group, led by Prof. Guangcan Guo, from Key Lab of Quantum Information, University of Science and Technology of China, proposed a novel method to transform information from spin encoding to route encoding. 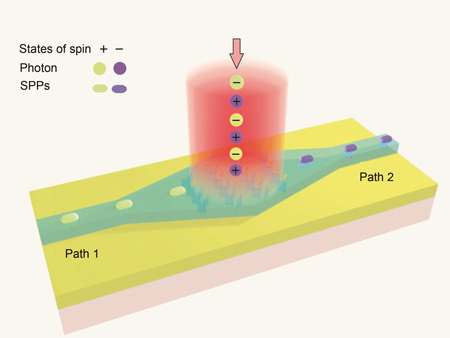 It is known that the photon spin state, i.e., the polarization of light, could affect the properties of the excited surface plasmon polaritons (SPPs). By manipulating the structure of the medium and the spin state of the excitation light, the propagation mode of SPPs can be controlled. Based on this mechanism, a spin-route encoding convertor (SREC) with special array structure on the center was designed, so that SPPs could be steered to a particular waveguide according to the spin states of the excitation light. For example, SPPs can be output from the left (right) waveguide with the input of left (right) polarization. Accordingly, the transformation from spin encoding to route encoding is realized. It is reported in Chinese Optics Letters Vol. 12, No. 7, 2014 (http://www.osapublishing.org/col/abstract.cfm?uri=col-12-7-072401). This method is based on the properties of SPPs depending on the excitation polarization. SPPs can break the diffraction limit and propagate along nanostructure. In addition, the SREC can be directly integrated on the chip, which can make the circuit more compact. It thus has a potential application in integrated photonics. The SREC has proved to be theoretically feasible by this work. Future work will be focused on the experimental verification. Because the current micro-nano processing technology can meet the precision requirement of the designed SREC, and the optical detection sensitivity can reach single photon level, the transformation of information from spin encoding to route encoding is expected to be experimentally realizable.